Formed outlet end fits 1-1/4 Inch, 1-1/3 Inch, 1-1/2 Inch, and 1-2/3 Inch, universal fit most hose Simply trim the end of the discharge pipe to the desired size. 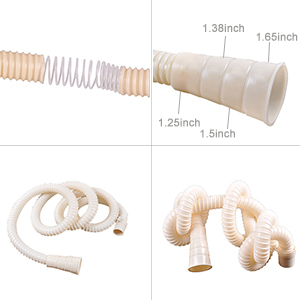 An extra-thick, high quality super flexible drain hose with hook end for stable use. Size:78.7 x 1.2 x 1.2 inches. This Extend Rubber Tube is what you need when something is out of you original control area, so add a Extend Rubber Tube will help you reach the goal. Made of imported entirely new PVC material with thickening treatment, features anti deformation, anti-aging, cracking proof and against high pressure, even after long term use it still looks very new and won't damaged easily.